Vector diagram of the human throat. X-Ray showing the throat. Note the dark colored band anterior to the spine. In vertebrate anatomy, the throat (Latin: gula) is the anterior part of the neck, positioned in front of the vertebra. It contains the pharynx and larynx. An important section of it is the epiglottis, which is a flap separating the esophagus from the trachea (windpipe) preventing food and drink being inhaled into the lungs. The throat contains various blood vessels, pharyngeal muscles, the nasopharyngeal tonsil, the tonsils, the palatine uvula, the trachea, the esophagus, and the vocal cords. Mammal throats consist of two bones, the hyoid bone and the clavicle. The "throat" is sometimes thought to be synonymous for the isthmus of the fauces. It works with the mouth, ears and nose, as well as a number of other parts of the body. Its pharynx is connected to the mouth, allowing speech to occur, and food and liquid to pass down the throat. It is joined to the nose by the nasopharynx at the top of the throat, and to ear by its Eustachian tube. 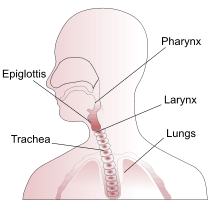 The throat's trachea carries inhaled air to the bronchi of the lungs. The esophagus carries food through the throat to the stomach. Adenoids and tonsils help prevent infection and are composed of lymph tissue. The larynx contains vocal chords, the epiglottis (preventing food/liquid inhalation), and an area known as the subglottic larynx—the narrowest section of the upper part of the throat. In the larynx, the vocal cords consist of two membranes that act according to the pressure of the air.